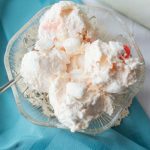 This is an updated version of the classic frozen fruit salad. It is simple and delicious. You will be amazed at how delicious it is! I love this recipe! It comes together so fast, it has marshmallows in it (my favorite!) and it is a nice cold treat for a hot day! It is sweet, fluffy and a perfect dessert! The classic recipes for frozen salads include mayo and serving it on a piece of lettuce. There is something about adding mayo to a dessert that just doesn’t settle with me. 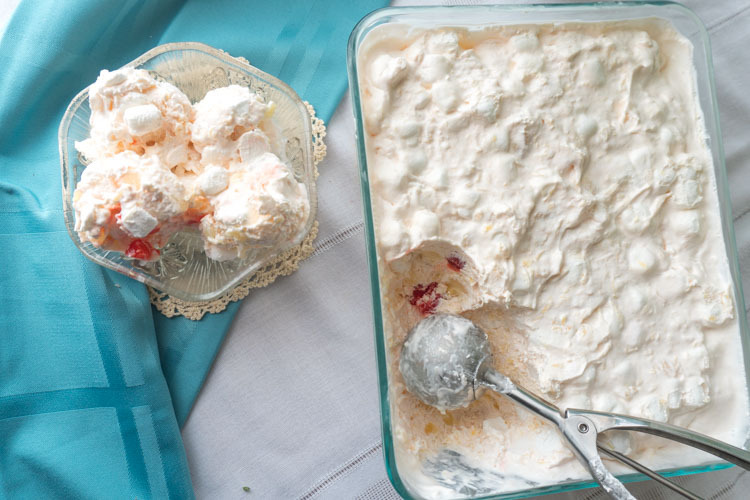 Mayo belongs on a sandwich or chicken salad, but a dessert? No thanks! 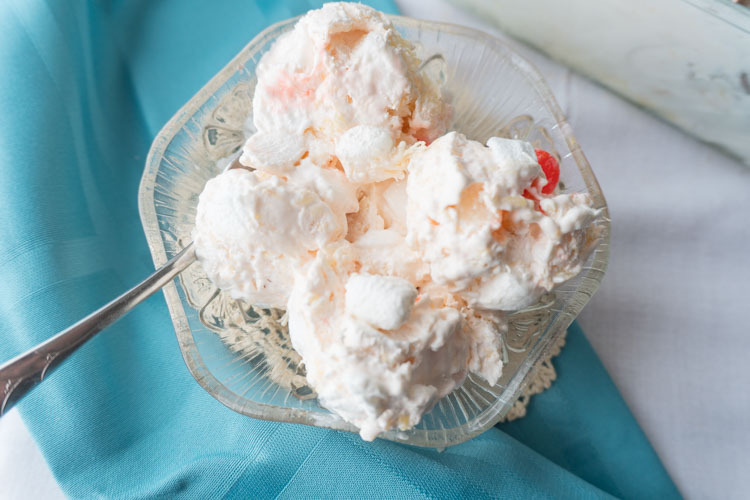 This recipe uses cool whip and sweetened condensed milk for its creamy delicious base. Add in a little lemon juice, some fruit and marshmallows (just because I love them! ), mix and freeze. 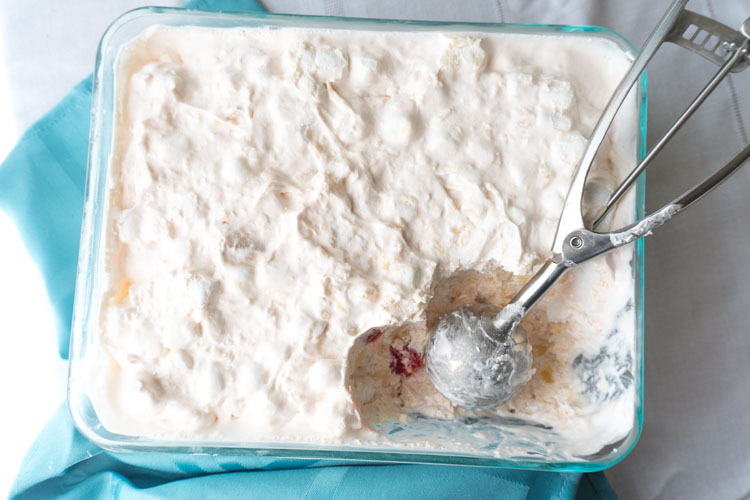 Seriously, this frozen fruit salad is so good and so simple. I like to make it the morning of or the night before I want to serve it. You can use whatever fruit that you want. I picked pears, maraschino cherries and pineapple for this one, but strawberries, blueberries and mandarins would work too! Or any other fruit you could think of! I also used canned fruit but this will work with fresh fruit too. It is so easy and so delicious! 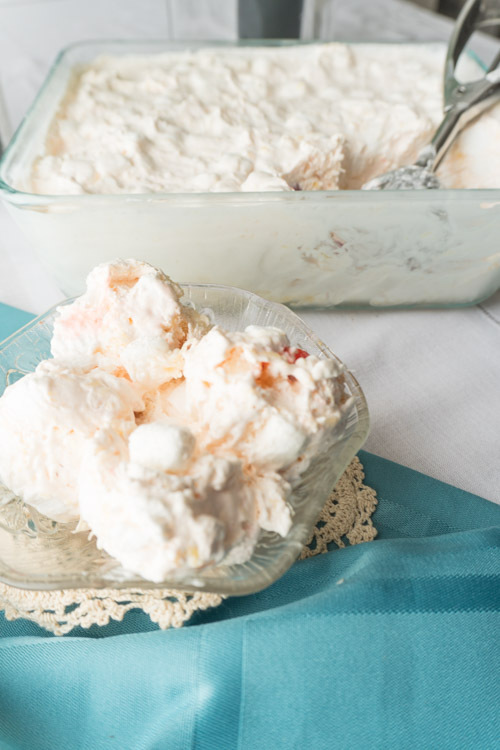 I also love to take fresh strawberries, slice them into large slices and dip them in this delicious creamy dessert. It is seriously so good you must try it! Did you grow up eating frozen fruit salad? What was your favorite version? Let me know in the comments below! This would be great with our chocolate chip cookies! This frozen fruit salad recipe is easy to make and easy to eat! A cold treat like this is especially good on a warm day! Spread into a glass 8x8 dish and freeze. Once completely frozen scoop out and enjoy! You can also freeze in individual cupcake liners.